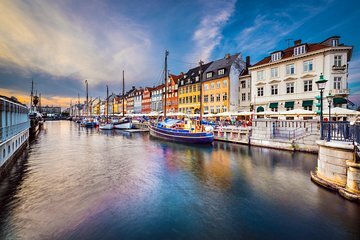 Climb aboard your sightseeing boat at a central docking point in Copenhagen and prepare to explore the captivating capital of Denmark. Listen to insightful commentary from your onboard guide as you cruise gently past iconic waterfront sights like The Little Mermaid statue; discover the cultural significance of the character created by Hans Christian Anderson and listen to tales of the author’s life in Copenhagen. See, too, the Danish Parliament and the majestic façade of Amalienborg Palace, the residence of Danish royals since the 18th century. Catch a glimpse of the futuristic Black Diamond structure and hear of what the edifice houses inside its dynamic walls. Sail through the charming Christianshavn neighborhood to see a vibrant array of painted houses and blooming flower boxes. 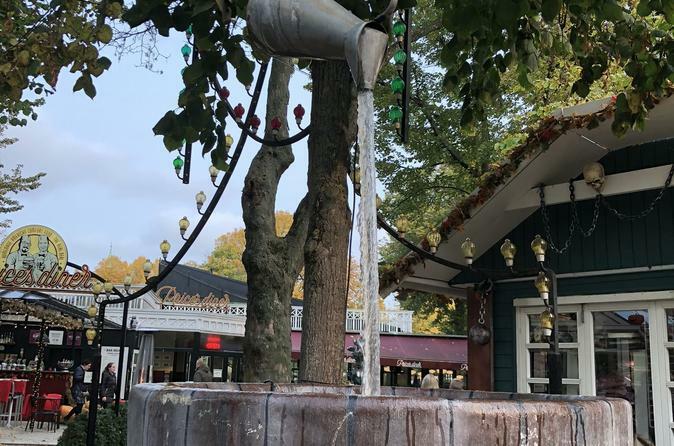 After an hour of sightseeing, end your cruise at your original departure point and make your own way to Tivoli Gardens with your skip-the-line-ticket. Sail past the long entrances lines and immediately immerse yourself in the carnival atmosphere within; marvel at colorful carousels and exhilarating rollercoasters and take in a concert on one of the outdoor amphitheaters when you need a break. Remain in the park until closing time if you wish, and then make your own way back to your accommodation. Your Viator voucher will be exchanged for two tickets: one Canal Tour ticket, and one skip-the-line admission ticket to Tivoli Gardens. Therefore your voucher must be exchanged at the departure point before arriving at Tivoli Gardens. The boat tour left on time, was comfortable, and covered many highlights. The only unfortunate part was that it was through a headset that was provided and these things tend to be cheap, uncomfortable, and often only one ear speaker works. However, the commentary was good. Entry tickets to Tivoli meant we could skip the line as advertised which was very good. We turned in our voucher in return for tickets to a canal cruise and Tivoli Gardens amusement park. Both were wonderful. My husband and I thoroughly enjoyed the cruise, got to see the statue of The Little Mermaid along the way, and also learned about Hans Christian Andersen and saw his residences. We cruised by many important buildings, We saw one was the royal family's house when the are in Copenhagen. We saw the offices of the largest container company in the world, Maersk. There was also a submarine on display in the canal. We learned about the bridges which we sailed under, connecting each land side of the canal and the history of various landmarks. The hostess spoke in a microphone to explain the various points of interest. We were allowed to take photos. We particularly liked the many pastel colored homes along the canal. It was a wonderful trip! We celebrated our 50th wedding anniversary this way.We also were admitted to Tivoli and rode the Carousel. There were many attractions, rides and foods including an adjacent Food Hall.We thoroughly enjoyed both the canal tour and Tivoli Gardens. I thought this was a good combo. The canal tour was very pleasent, a great way to see more architecture. Trivoli Gardens is a must do. It's magical. The Canal tour was great. It was a warm day in Copenhagen and it was nice to be on the water. The guide did a good job of pointing out several highlights. We were very glad that we chose the canal tour and Skip the Line Entry to Tivoli. On the day we went to Tivoli there was a long line to enter. We were so happy to be able to walk quickly through the gate.My husband and I would not hesitate to recommend this combo tour ticket. A great way to see Copenhagen through the canals, and the Tivoli gardens experience is a must to see. Take your camera. We visited Copenhagen while on our Baltic cruise and decided to see the highlights on our own rather than through the ship. Being early August, the city was jammed with tourists and we had a bit of a challenge finding the canal tour on our own. The tour itself was okay but not awesome. Maybe because what you see along the canals is not very exciting. We got to see the Little Mermaid statue from behind (she faces the shore) and it was surrounded by other canal boats and throngs of people on-shore. After the canal ride, we had to make our way over to Tivoli Gardens which was interesting but not as spectacular as hoped. We're not big carnival ride aficionados so we didn't ride anything - just walked around. The grounds are quite lovely. There are many restaurants there but we weren't looking to eat so I can't comment on them. We didn't need the skip-the-line option at Tivoli because it wasn't that busy when we were there (mid-afternoon). The bottom line is that this was a less expensive way to see these sights in Copenhagen than buying a shore excursion through the ship, and was probably also cheaper than buying the two tickets at the time, although I didn't note the prices so can't be sure of that. So like I said, good but not outstanding. the canal tour was very informative with a wonderful guide. Great way to see Copenhagen.